The Colorado Department of Public Safety's Division of Fire Prevention and Control (DFPC) is pleased to announce the start of an exclusive use SEAT contract with Aero Tech, Inc, that began on Monday, April 1, 2013. The SEAT is operational out of the Fort Collins/Loveland airport. The division will introduce the DFPC SEAT staff and vendor on Friday, April 5. 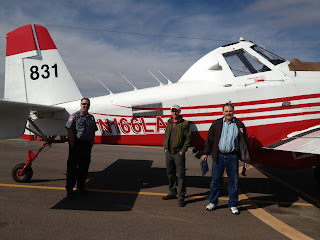 Meet DFPC SEAT staff and vendor, Aero Tech, for the 2013 season and see demonstration from FIRE ICE , fire suppressant. The start date and location of a second Exclusive Use SEAT is being confirmed at this time.